Healy is Ray, a kind of loser who stumbles upon a new business… providing kidnapping scenarios for willing clients. Business is bad – there is an hilarious opening with Ray trying to get a loan from a local bank – until a new client emerges (Taylor Schilling of ‘Orange is the New Black’), who wants more from the service than the faux kidnapper had ever provided. The film, rich with tones of darkness and redemption, is exquisitely fashioned by Pat Healy, in his first feature length film as a director. Pat Healy has been a journeyman actor, with close to 100 roles in a career that began in the mid-1990s. He is a film buff, who has studied the masters over the years and filters them through this film scenario. HollywoodChicago.com had the opportunity to talk to Healy, a couple of days before he represents his film – he will introduce and participate in a Q&A – at the 2017 Chicago Critics Film Festival on Monday, May 15th. HollywoodChicago.com: What genre sense did you want to construct from Mike Makowsky’s script, in your approach to the material? Pat Healy: There are very dense references in the film, which is not only the way I view movies but the way I view life… because movies have been a part of my life since I was a very small kid. In the broader spectrum, it seemed to me the film was divided between film noir and a screwball comedy. On the noir side, visually I was looking at the 1970s versions, like ‘Klute,’ ‘The Parallax View’ and ‘All the President’s Men.’ For Los Angeles, I was looking at Robert Altman’s ‘The Long Goodbye,’ for a sense of L.A. from the ‘70s that doesn’t exist anymore. HollywoodChicago.com: How about the screwball comedy side? HollywoodChicago.com: What quality did Taylor Schilling bring to the role of Anna that surprised even you? Healy: It was a surprise in the extent to which she took the role. I certainly saw that in ‘Orange is the New Black,’ because she could be airy and funny, but also having dramatic chops when called upon. I kept thinking again of Carole Lombard, how she could be this beautiful and glamorous movie star, yet she could be hilarious or dramatic. She did the screwball roles where she drags some schlub down the rabbit hole, and Taylor can do that as well. She was first on my list of people who I knew I could get the script to, and she was the first to see it. When we actually shot it, she really surprised and exceeded my expectations on how far she took the character. It gave a great and tangible meta quality to the film, with two people putting on a ‘show,’ but my character not knowing when it is a show and when it isn’t. As a director, supposedly controlling the scenario, I thought I had that authority as well, but also found that I wasn’t in control at times either, and it all worked out well. HollywoodChicago.com: What was your technique for formulating the screenplay visually? Did you use storyboards or some other technique? Healy: It was never storyboarded per se, but each and every shot was meticulously worked on and talked about for months. Since I was also acting in the film, I wanted to know what was happening on the set succinctly each day, and wanted everyone else to know as well, because then I could free my mind when we actually shot it. HollywoodChicago.com: You mentioned Los Angeles as a character in the way you wanted to create atmosphere. What did you express about L.A. that you think makes it a character in ‘Take Me’? Healy: Well, the film was written fairly non-specific, not necessarily set in L.A. However, I recognized that I wanted to shoot the film in L.A. because I live here and love it here. And the story itself is much about life in Los Angeles, whether you’re an actor or not, because everyone is putting on a performance for other people every day. It’s about that facade we put up, because L.A. is a lonely town, dictated by an auto culture. It’s not like New York City or Chicago where people are out on the streets and seeing each other. The movie is about two people who are lonely and isolated, and believe that they have to be somebody that they aren’t, and when they actually come together they don’t connect, because even though they think they’re working from the same script, they’re not. The confusion, humor and tension come from that, and it is in a sense emblematic of Los Angeles. HollywoodChicago.com: Your character of Ray Moody seems like a Willy Loman-type, but with more of a happier salesman quality. How did that evolve when you were developing the character? Healy: Like anything else, it comes from a nugget of truth that is within me. In this case, it was the idea that I was getting too old to hustle in show business the way I had been for so long, in trying to be a working actor. I also wasn’t necessarily raised to believe that being vulnerable and sensitive was an asset, so it took me awhile to get there, and my work started to soar once I did get to that place. But before that I had always thought of my persona as a movie tough guy, so I thought of Ray as someone who was trying to run his life like a tough-guy movie. How he talks, the way he moves, his toupee and his spray tan, was his idea of what being a man is. So when the strong feminine presence of Anna comes into his life, it tears him apart and breaks him down, so he can finally get started on being himself. HollywoodChicago.com: Since it has been a number of years since you last tried directing, what was the motivation to make your feature debut at this point in your career? Healy: Actually directing was always what I wanted to do, since I’ve been a cinephile from a young age. I got my foot in the door as an actor, and I made a short [‘Mullitt’] that premiered at Sundance in 2001. But it occurred to me afterward that I really wasn’t a writer, in the feature film sense, and nobody was offering me other scripts. So I began the process of learning how to write a feature, and eventually taught myself how to do it. I had a few scripts that got attention, but they were all on the high-end, budget-wise. I was kind of giving up on the idea of directing, and never even considered that I would direct someone else’s script. And then Mike’s ‘Take Me’ fell into my lap, and we got to know each other well, and started working on it with my direction in mind. I felt I had a unique understanding on how it should be done, and that’s how we did it. Healy: Steven Spielberg. His movies can basically be understood with the volume turned off. He’s such a brilliant visual artist, and thinks in terms of the image with the sound. Now ‘Take Me’ is a dialogue-heavy independent movie, but I tried to focus on telling the story visually as much as I could. Even though there is a lot of dialogue, we do see in the two character’s physical connection, a sense of their relationship in how they are looking at and reacting to each other. I would hope if you were sitting on a plane and watching it with the sound off, that you would still know what was going on in the story. 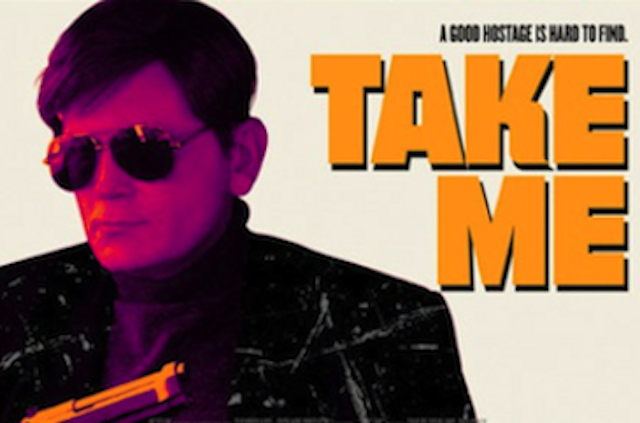 The Chicago Critics Film Festival presents “Take Me” on Monday, May 14th (7:15pm) at the Music Box Theatre, 3733 North Southport, Chicago. The 2017 CCFF takes place from May 12th through May 18th. For a complete schedule and more information… including purchasing tickets, click here. “Take Me” is currently in limited release and on iTunes (click here). See local listings for theaters and show times. Not Rated.